I decided I would go to a Classical Painting Course. It's based near Drogheda. The name of the school is called Rossnaree. It's situated beside Newgrange. It's beautiful out there. The course is just brilliant. I always wondered how those Renaissance painters got such great life, composition and that dramatic lighting that you hardly see in any other paintings. You know that light just just makes you look great! 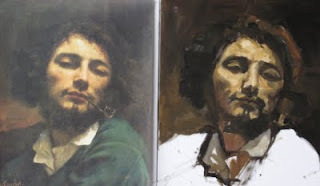 One of the exercises in this course is to copy a painting from the great masters. The technique of painting is totally different to what I'm used to doing, I'm not sure which is better. I stood in the darkest part of the room so I hardly had light and my colours became a bit muddled at one point. So that's what my copy looks like. 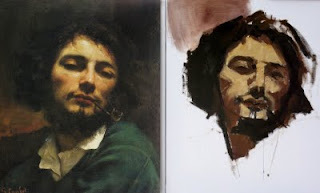 Next week I'll work with a life-model and I am interested to hear his critism this time. 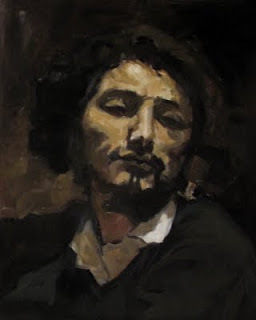 His critism on my painting was : " I like your style of painting, close by it's a wreck - far away it makes sense, Courbet would have made sure that it made sense both ways. I'm tempted to go to the National Gallery now to set up an easel and copy a few more now, just to learn from them. Another thing I learnt was using the limited palette. I'm still impressed by the colours you can mix with black, white, yellow and a tiny bit of red. All the materials we used are just of great quality. Adam Markovic (the tutor) makes his own sun-thickened linseed oil which you can only buy from him. I'm lucky because that stuff is probably the best thing I've worked with so far. The paints we used are from that brand "Old Holland" - I bought a tube of blue there the other day nearly 50 Euro - not cheap! Right, I won't carry on anymore. I'll have more to post next week. It's all been an interesting and inspiring weekend for me - also tiring. Some days were about 11 hours long of drawing and painting. I think this school is a great opportunity - it's so cool that someone told you about it! Wow, That looks really great! I'm glad you're enjoying the course! Catch up with ya soon.